So the season of festivities has jollied many of us along and dumped us shivering into the cold and grey reality of January. Too many mince pies and an over-reliance on the comforts of rich, roasted dinners has left many an uncomfortable belt where once a trim waistline used to reside, so many people will be thinking of cutting a few of their favourite things out as part of their new resolution. I have also decided to cut out a few of my favourite things; but these won’t be crisps and chocolates that I eschew – it will be my most favourite things in life (not including those precious to me and my dear Giantmonk). 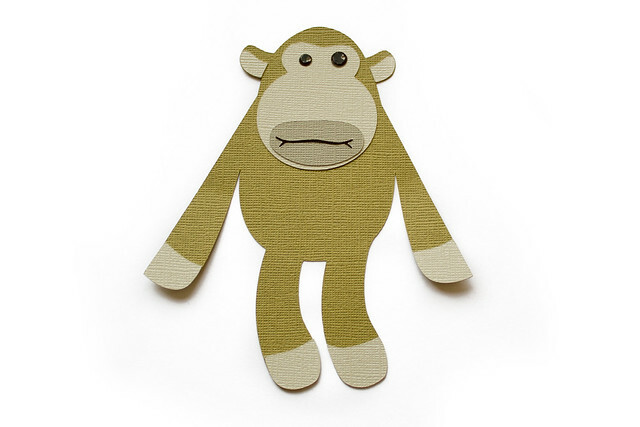 And when I say I am going to ‘cut them out’ I don’t mean that I am going to avoid them, I mean I am going to literally cut them out (of paper), and knit them, and draw them, and make them from clay and craft them in a huge number of other ways. Narwhals are among my most favourite things, and perhaps the inspiration behind this idea. I was thinking of experimenting with designing simple papercuts and card toppers for a bit of paper-crafting, ready for the next wave of birthdays and weddings, and to try to get me back in the creative mood. Thinking of what to start with the things that usually first to spring to mind are, understandably, the things that make me happy, and cue the narwhals. After creating this little pod* of narwhals and reflecting on how happy they made me, I decided that the subjects of the things that I make should indeed bring me joy, and so I jotted a short list of my most favourite things. This list may change, get longer or shorter in time, but for now it is a little reminder of the things that make me happy, and I’m going to try to create a few projects based on the items, ideas or stories in that list throughout the year. 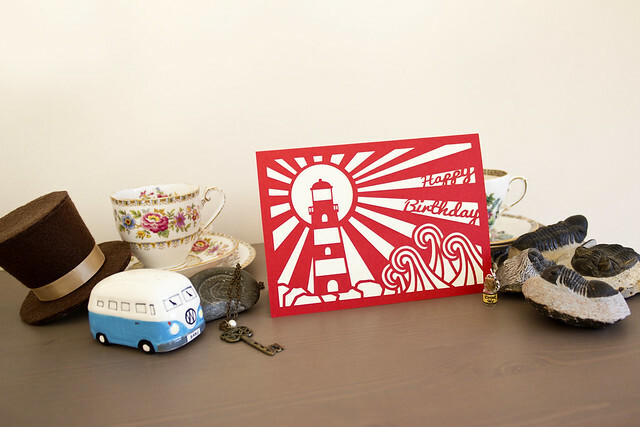 Another of the Favourite Things list items is lighthouses. I have always loved the idea of lighthouses, from the lighthouse inhabited by the old lighthouse keeper and Sprocket in Fraggle Rock** to the one where my husband and I walked to in the pouring rain on our first date in Whitley Bay, and therefore they have a special place in my heart as a protective and caring source of light and hope. 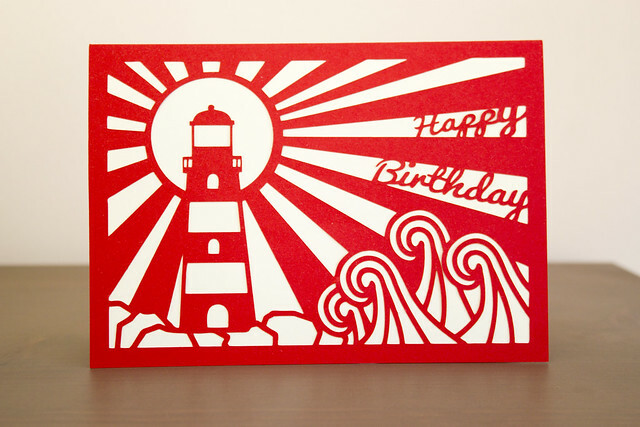 I decided to make a birthday card with a lighthouse theme. I have enjoyed experimenting with the idea of using the negative space to cut a recognisable design from a contiguous single layer of card, placed over a contrasting colour to provide the image. It’s a challenge that sparks the need to approach the idea of shape and design, but it’s also a lot of fun with a cup of tea nearby and Illustrator beaming out from the laptop in front. These are really only the very first of my experiments, so I am sure that I will find new ways of putting ideas into action as I work a bit more with paper and card as materials, but at the moment it has provided the first little flutter of inspiration after the creative drought. I’m really happy with the finished card, perhaps to the point that I don’t actually want to give it away, but I know that I can cut it again, without the sentiment, and frame it if I ever wanted (or could find room for) a bit of extra art on the wall. And now I have many more of my favourite things to experiment with design and creation, which will hopefully bring about further ideas and exciting projects. Oh, and when I said I wasn’t going to cut out Giantmonk? It was a bit of a fib. *When checking I had the collective noun right, Google also suggests that a ‘blessing’ of narwhals is acceptable – though the validity of origin seems a little hazy, it seems to be in common enough use to now be in usage. I’d head of a ‘blessing’ of unicorns (which also make it onto ‘the list’) before now, and as the obvious sea-cousins of the unicorns, perhaps this is where the similarity in collective noun has been made. **In case this confuses any U.S. readers, though Sprocket in your version of the series lived in a workshop with an inventor, and in various other locations around the world, here in the U.K. they were based in a lighthouse above ‘Fraggle Rock’. Ah you are so clever. I love the lighthouse card. They are also one of my favourite things. I grew up on the coast. The light and sound from the lighthouse on foggy nights is one of my memories from childhood. well my first thought was patchwork – but I may be obsessed. how, HOW did you cut that so neatly! I have dies and a mangle (sizzix big shot) I could not cut that neatly with a knife. yes, here is to cutting out things. Beautiful. 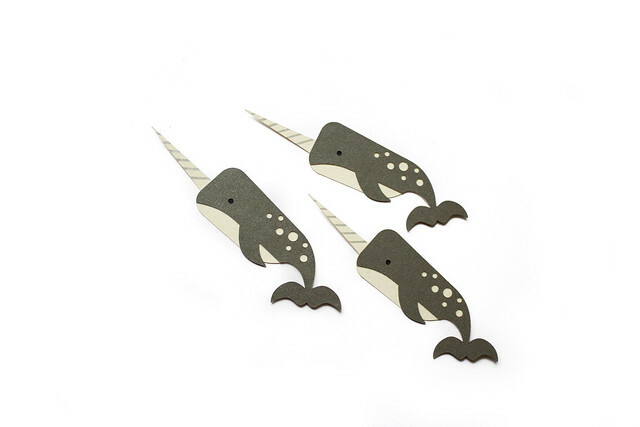 I love that….a blessing of narwhals. Happy New Year to you and Giant Monk! Those narwhals are amazing. I, too, love narwhals, and all things whale. 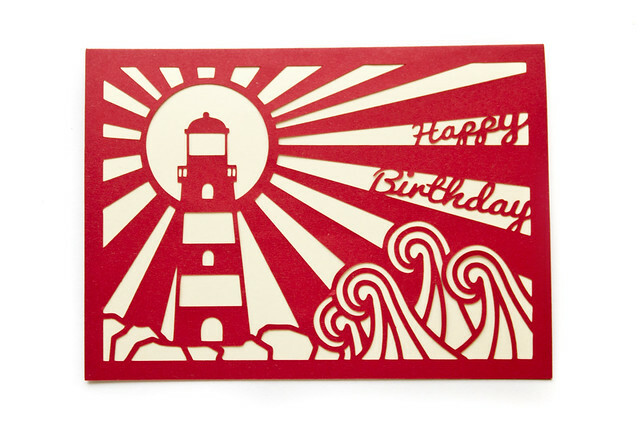 I am very jealous of your paper cutting skills – so beautiful! I can’t wait to see what else you are “cutting out” soon. I knew about Sprocket’s owner lived in a lighthouse in the UK! Did you know that his owner was a baker in France? And another inventor in Germany? I love Fraggle Rock! These are so lovely, so much talent!